TMZ are reporting that the Jonas Brothers MAY be breaking up resulting in the cancelation of their upcoming North American tour. An excerpt from the article can be found below. "The Jonas Brothers -- Kevin, Joe and Nick -- are close to breaking up ... they are going in 3 different directions and the band has lost its identity ... sources close to the group tell TMZ. 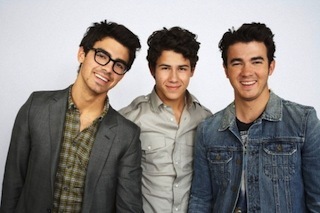 The Brothers Jonas just cancelled their entire upcoming tour -- 19 concerts, which was supposed to kick off Friday. Our sources say ... the rift exploded over the release of their next batch of songs. Each brother had a different vision of where they wanted to take the band, ranging from pop to hard rock. They all agreed on one thing -- releasing anything new would be a disaster, because the style would be all over the place. The concert cancellation may be a precursor to an official breakup, but so far no decision has been made. Our sources say the guys are meeting this weekend to try and hash things out. We're told, "It could go either way."